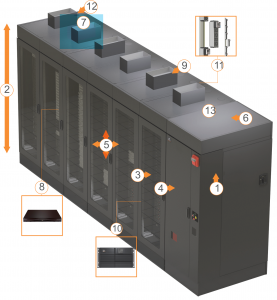 Simple, fully integrated infrastructure – racks, dedicated cooling, management, fire suppression, cable management and power distribution are designed to work together, saving you time and money on installation and operation. Reliable on-line uninterruptible power – Liebert GXT4™ UPS with the industry’s smallest footprint and / or the flexible 5-20kVA Liebert APS™ modular, redundant UPS for row -based applications. 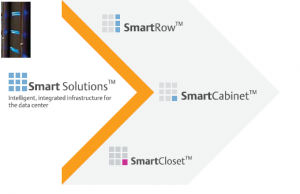 The SmartRow infrastructure utilizes seven data center best practices and technologies to achieve a unique set of benefits.